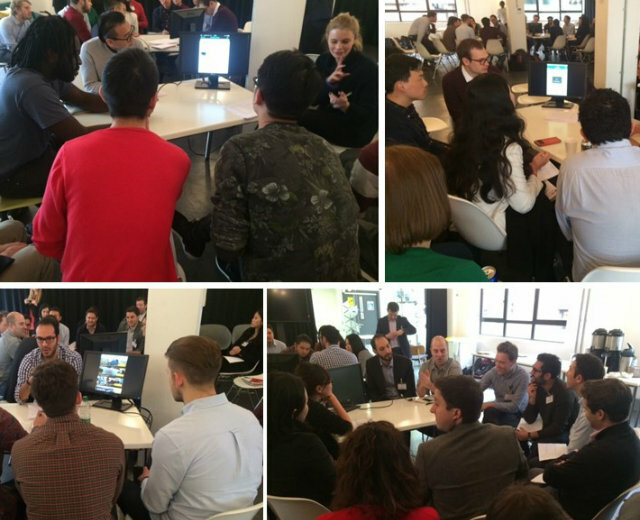 Our China Hackathon took place on 10th March at Google Campus in conjunction with the China Britain Business Council. The event focused on both the language difference between apps and platforms developed for western markets, and also the cultural, visual and user experience differences to be taken into account by companies wishing to expand into the Chinese market with a customer facing interface. This was a workshop-based event which connected 4 companies who were looking to take their apps to the Chinese market with 4 UX/UI designers who advised the companies on the layout & design changes needed to engage with Chinese consumers, all in front of a live audience. When comparing a Western style app with an app developed for the Chinese market, it’s clear that localisation doesn’t simply mean changing the language. The Chinese app market is dominated by domestic apps and those companies wishing to make their apps successful in the market need to be aware of the cultural, visual and user experience differences as well. First things first, what’s your strategy for moving into China? When setting up in China, you have a choice. You can either have a representative office, set up a Wholly Foreign Owned Enterprise or enter the market via a joint venture. The recommended move is a joint venture with a local partner who can lend you their expertise. Evernote is another example. The popular note-taking app achieved four million Chinese users only one year post launch in the market. They were careful to integrate partner with local partners, including releasing an API for integration with local apps such as Weibo, WeChat and Duoguo. What are you going to call your app? Do you go for a literal translation or a phonetic translation? Bear in mind that both options can have their pitfalls. With the first, your global brand is disassociated from your Chinese brand and you’ll need to spend a lot on brand marketing to connect the two. With a phonetic translation, you need to be aware of the connotations associated with those Chinese characters. For example, Peugeot's Chinese name Biao Zhi means "handsome." When pronounced in southern China, it sounds similar to a term for “prostitute”. Ideally you want to choose a name which resonates semantically and phonetically with your global brand such as Coca Cola, who chose Ke Kou Ke Le, meaning “tasty fun”. Evernote, again, is another success story. It chose to base its name on the app’s function Yinxiang Biji, meaning “memory note”. Even better, the second character of the Chinese name, 象, means “elephant” which is the logo of Evernote, helping to associate the global brand name with the Chinese brand name. When expanding into a new market such as China, companies need to consider making larger changes to their apps than their branding and marketing strategy. It’s important to be aware of the cultural differences which affect the way a Chinese consumer might engage with your app. For example, to improve functionality for Chinese consumers Evernote localised its product with features that are tailor-made for China. One of these is its “sync only with WiFi” feature which allows Chinese consumers to access the app through Wifi rather than 3G. Evernote created this feature after noting that 3G is expensive in China. Furthermore, due to the Great Firewall of China, Chinese consumers have to deal with slow connection speeds if they want to access to overseas networks. Many data centres are located outside of China, leading to painfully slow synchronisation speeds. Aware of this, Evernote located its first overseas data centre in China itself. There are a number of visual differences to take into account when designing an app for the Chinese market. For example the way a Chinese consumer reads a page is completely different to a Western consumer. They are much more likely to read further down the page, while Western consumers only take in the top section. For that reason it’s possible to include key information further down. Other things to be aware of are the cultural differences. For example in the West, 7 is considered lucky whereas in China 6 is the lucky number. In the West, white is seen as the colour for purity and is worn at weddings whereas in China it is worn at funerals. See below some example of apps that have been localised successfully for the Chinese market. 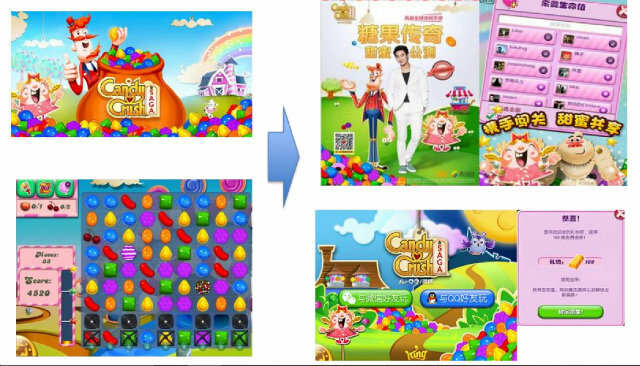 This example is particularly interesting as, despite the fact that China’s State Administration of Press, Publication, Radio, Film & Television suppresses sexual content, it is clear that the Chinese version of Miniclip’s app is more sexualised than its Western counterpart.